Learn how to train and evaluate an unsupervised machine learning model — principal component analysis in this article by Jillur Quddus, a lead technical architect, polyglot software engineer and data scientist. There are numerous real-world use cases, where the number of features available, which may potentially be used to train a model, is very large. A common example is economic data and using its constituents, stock price data, employment data, banking data, industrial data, and housing data together to predict the gross domestic product (GDP). Such types of data are said to have high dimensionality. Though they offer numerous features that can be used to model a given use case, high-dimensional datasets increase the computational complexity of machine learning algorithms and more importantly may also result in over fitting. Over fitting is one of the results of the curse of dimensionality, which formally describes the problem of analyzing data in high-dimensional spaces (which means that the data may contain many attributes, typically hundreds or even thousands of dimensions/features) but where that analysis no longer holds true in a lower-dimensional space. Informally, it describes the value of additional dimensions at the cost of model performance. 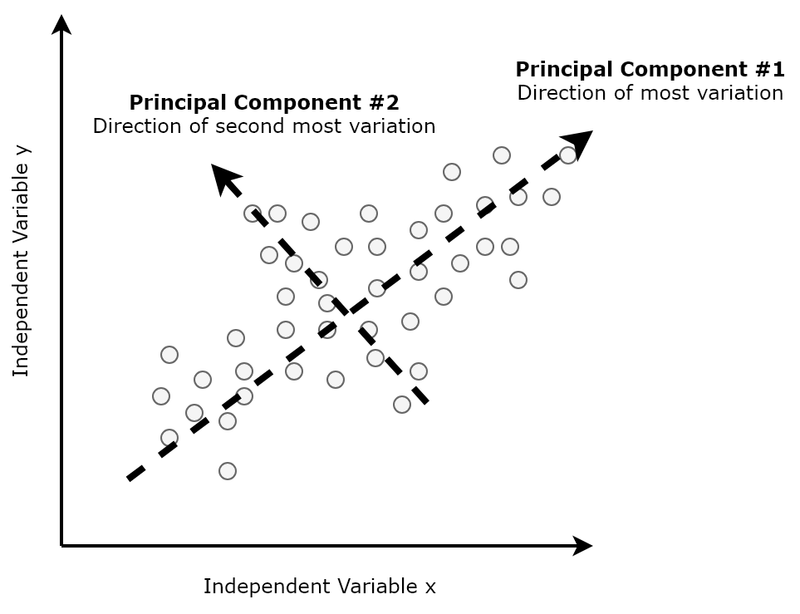 Principal component analysis (PCA) is an unsupervised technique used to preprocess and reduce the dimensionality of high-dimensional datasets while preserving the original structure and relationships inherent to the original dataset so that machine learning models can still learn from them and be used to make accurate predictions. To better understand PCA, let’s study a movie recommendation use case. Our aim is to build a system that can make personalized movie recommendations to users based on historic user-community movie ratings. The historic user-community movie ratings data that we will use for our case study has been downloaded from GroupLens, a research laboratory based at the University of Minnesota that collects movie ratings and makes them available for public download at https://grouplens.org/datasets/movielens/. For the purposes of this case study, we have transformed the individual movies and ratings datasets into a single pivot table where the 300 rows represent 300 different users, and the 3,000 columns represent 3,000 different movies. This transformed, pipe-delimited dataset can be found in the GitHub repository at https://github.com/PacktPublishing/Machine-Learning-with-Apache-Spark-Quick-Start-Guide/tree/master/Chapter05/data/movie-ratings-data and is called movie-ratings-data/user-movie-ratings.csv. You can also find the code file for this article at https://github.com/PacktPublishing/Machine-Learning-with-Apache-Spark-Quick-Start-Guide/blob/master/Chapter05/chp05-02-principal-component-analysis.ipynb. In this case, each movie is a different feature (or dimension) and each different user is a different instance (or observation). This sample table, therefore, represents a dataset containing 5 features. However, our actual dataset contains 3,000 different movies and therefore 3,000 features/dimensions. Furthermore, in a real-life representation, not all users would have rated all the movies, so there will be a significant number of missing values. Such a dataset, and the matrix used to represent it, is described as sparse. These issues would pose a problem for machine learning algorithms, both in terms of computational complexity and the likelihood of over fitting. To solve this problem, take a closer look at the previous sample table. It seems that users that rated Movie #1 highly (Toy Story) generally also rated Movie #2 highly (Monsters Inc.) as well. We could say, for example, that User #1 is representative of all fans of computer-animated children’s films, and so we could recommend to User #2 the other movies that User #1 has historically rated highly (this type of recommendation system where we use data from other users is called collaborative filtering). At a high level, this is what PCA does — it identifies typical representations, called principal components, within a high-dimensional dataset so that the dimensions of the original dataset can be reduced while preserving its underlying structure and still be representative in lower dimensions! These reduced datasets can then be fed into machine learning models to make predictions as normal, without the fear of any adverse effects from reducing the raw size of the original dataset. Our formal definition of PCA can therefore now be extended so that we can define PCA as the identification of a linear subspace of lower dimensionality where the largest variance in the original dataset is maintained. 1. First, we standardize the original high-dimensional dataset. 2. Next, we take the standardized data and compute a covariance matrix that provides a means to measure how all our features relate to each other. 3. After computing the covariance matrix, we then find its eigenvectors and corresponding eigenvalues. Eigenvectors represent the principal components and provide a means to understand the direction of the data. Corresponding eigenvalues represent how much variance there is in the data in that direction. 4. The eigenvectors are then sorted in descending order based on their corresponding eigenvalues, after which the top k eigenvectors are selected representing the most important representations found in the data. 5. A new matrix is then constructed with these k eigenvectors, thereby reducing the original n-dimensional dataset into reduced k dimensions. If the covariance is positive, this implies that the independent variables are positively correlated. If the covariance is negative, this implies that the independent variables are negatively correlated. Finally, a covariance of zero implies that there is no correlation between the independent variables. Here, we are computing the covariance between all variables. A covariance matrix is a symmetric square matrix where the general element (i, j) is the covariance, cov(i, j), between independent variables i and j (which is the same as the symmetric covariance between j and i). Note that the diagonal in a covariance matrix actually represents just the variance between those elements, by definition. In linear algebra, eigenvectors are a special set of vectors whose direction remains unchanged when a linear transformation is applied to it, and only changes by a scalar factor. In the context of dimensionality reduction, eigenvectors represent the principal components and provide a means to understand the direction of the data. We say that λ is an eigenvalue of matrix A, and x is an eigenvector associated with λ. In the context of dimensionality reduction, eigenvalues represent how much variance there is in the data in that direction. Once all of the eigenvectors for the covariance matrix are found, these are then sorted in descending order by their corresponding eigenvalues. Since eigenvalues represent the amount of variance in the data for that direction, the first eigenvector in the ordered list represents the principal component that captures the most variance in the original variables from the original dataset, and so on. For example, as illustrated in the figure below, if we were to plot a dataset with two dimensions or features, the first eigenvector (which will be the first principal component in order of importance) would represent the direction of most variation between the two features. Using this as an example, we would select around the first 300 principal components, as these describe the most variation within the data out of the 3,000 in total. Finally, we construct a new matrix by projecting the original dataset into k-dimensional space represented by the eigenvectors selected, thereby reducing the dimensionality of the original dataset from 3,000 dimensions to 300 dimensions. This preprocessed and reduced dataset can then be used to train machine learning models as normal. The resulting matrix now has dimensions of 300 x 300, confirming the reduction in dimensionality from the original 3,000 to only 300! We can now use this projected matrix and its PCA feature vectors as the input into subsequent machine learning models as normal. Again, this new dataframe and its PCA feature vectors can then be used to train subsequent machine learning models as normal. The resulting vector (of 300 elements) shows that, in our example, the first eigenvector (and therefore the first principal component) in the ordered list of principal components explains 8.2% of the variance; the second explains 4%, and so on. 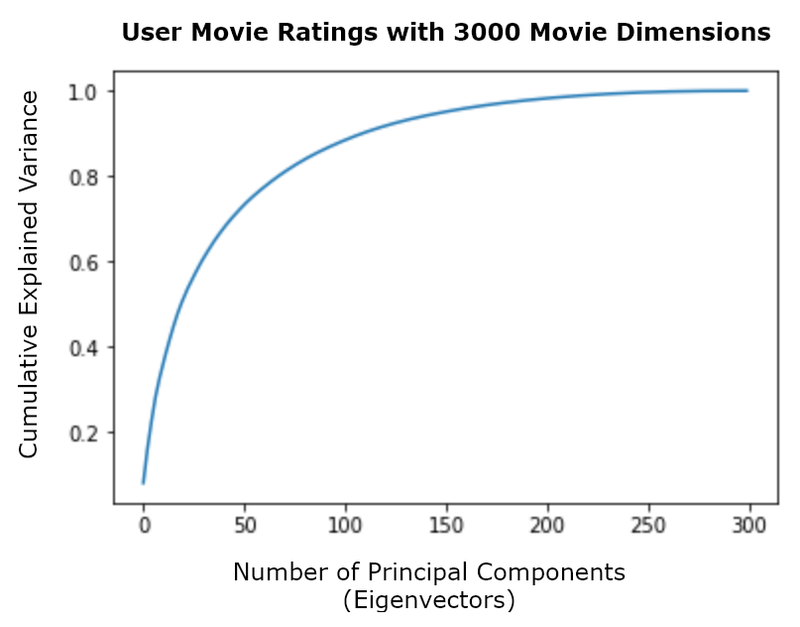 In this example, we have demonstrated how we can reduce the dimensionality of the user-community movie ratings dataset from 3,000 dimensions to only 300 dimensions while preserving its structure using PCA. The resulting reduced dataset can then be used to train machine learning models as normal, such as a hierarchical clustering model for collaborative filtering. If you found this article interesting, you can explore Machine Learning with Apache Spark Quick Start Guide to combine advanced analytics including machine learning, deep learning neural networks and natural language processing with modern scalable technologies including apache spark to derive actionable insights from big data in real-time. Machine Learning with Apache Spark Quick Start Guide can help you become familiar with advanced techniques for processing a large volume of data by applying machine learning algorithms. Principal Component Analysis — Unsupervised Learning Model was originally published in Hacker Noon on Medium, where people are continuing the conversation by highlighting and responding to this story.